The article “Place a Premium on Pet Insurance” [June/July 2018] advising veterinarians on the importance of proactively promoting pet health insurance and the subsequent benefits to patients, clients and practice was clearly well-intended. 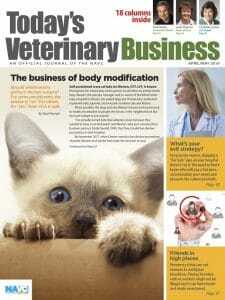 Unfortunately, the article contained some factual errors and flawed advice to practice managers and veterinarians. I am a former practicing veterinarian with over 19 years of executive experience in the pet health insurance industry. It is my opinion that the enthusiastic embracing of pet health insurance by companion animal veterinarians could be the singular most powerful tool to increase veterinary revenues and reduce the incidence of economic euthanasia. The effective use of this tool by veterinary staff members requires intimate knowledge about policies offered by different companies and management’s dedication to making the tool function. First, I don’t recommend purchasing policies that combine wellness benefits with accident and illness coverage. Insurance premiums are calculated by predicting the medical cost risk associated with accident and illness. Wellness premiums are based on the predictable usage of fixed-cost services. Attempting to combine both premiums into one creates a client illusion that insurance is an investment. Pet owners then tend to compare premiums paid to benefits received and, if the latter lags the former, the value of insurance is often questioned and policies canceled. Insuring a pet is purchasing peace of mind — no more, no less. The single factor that requires a thorough investigation is a comparison of the premium charged with the potential benefits provided by the insurance company. Premiums can vary greatly in different ZIP codes and by different companies for nearly identical coverage. Third, placing the full decision of selecting a pet health insurance policy in the client’s hands to make it easier on veterinary staff members is an abdication of ethical responsibility. It is clearly important for veterinarians and staff to educate pet owners about the costs and medical risks associated with owning a pet. There are excellent examples of practices assuming this responsibility in the article. More practices are setting goals to proactively increase the percentage of insured pets in their patient database. As the percentage of insured pets goes up, compliance will increase, revenue will increase, economic euthanasia will decrease and team morale will improve proportionately. Lastly, while pet insurance policies are very similar, there are a few differences to look for. Policy waiting periods, coverage for dental accidents versus dental illness, and understanding the difference between annual or “per incident” deductibles are important. Most companies provide benefits for physical therapy; others may not without an extra premium. Also, some companies will not provide benefits for veterinary exam fees. This exclusion can substantially increase the true amount of the deductible the policyholder is required to pay for each individual accident or illness. Disclaimer: I am not employed by or receiving any financial compensation from any company or individual associated with the pet health insurance industry. Dr. Kent A. Kruse is the owner of Kruse Veterinary Consulting in Sturgeon Bay, Wisconsin.